Taiwan the often missed dive destination. I have a challenge for you I want you to go through your gear bag and look at the country your gear was made in and then see how much of it was made in the island nation of Taiwan. For me most of my gear was made there, even my beloved ScubaPro Jet Fins. Taiwan has become a manufacturing superpower when it come to scuba gear. With all that manufacturing going on there and its geographic location you would think that Taiwan is a huge diving mecca as well. Here in California we are home to many diving company’s headquarters, and we have a healthy population of divers and ever increasing numbers. But, not so in taiwan. In fact, Taiwan is not considered a major diving destination and I hope to change that with a brief introduction with my experience there this year. Taiwan on old maps can still be seen with the name Formosa, this apt name means beautiful place. Taiwan is indeed a beautiful place, it sits in the South China Sea north of the Philippines and south of Okinawa and only about 80 miles east of China’s eastern coastline. Taiwan sits right on the Tropic of Cancer and is subject to extremely hot summers, warm winters and torrid monsoonal weather. Water temperatures generally range from 76 to 85 degree Fahrenheit. From my experience, April and October are the best months to plan a dive trip to Taiwan as these are transitional months, and temperature can be quite mild. As the world spins on its axis the equatorial waters are warmed and travel in a westward direction this is called the Kuroshio current. The Kuroshio Current then turns northward where it meets the southern end of Taiwan in an area called Kenting. The current then splits going up the west side into the Taiwan Strait or the east side toward Taipei to rejoin with the water again traveling northward towards Japan. As you can see, sitting right in the middle of this mighty current, Taiwan is in the perfect position to receive much of the life in the Pacific. The Kuroshio Current carries warm water teeming with life, nutrients and coral polyps. All this is deposited in the Kenting National Park. Kenting is one of five geographic diving areas they are: Kenting, Orchid Island, Green Island, Xiao Liu Qiu and Penghu Islands. All five of these areas have very distinct diving and the diver will never tire of what he or she may may find. What will the diver find in Taiwan’s rich diving areas? Down in Kenting there is a huge number of different marine species that the area is home to, here also is 60 percent of the world’s different types of corals, In Kenting a diver may also see large pelagics like swordfish, whale sharks and even little pygmy seahorses. Orchid Island is a true diver's paradise, here you will find coral gardens, a korean tanker and sea snakes. Green Island has hammerhead sharks, spotted rays and surface intervals can include soaks in the hot springs and romantic vistas overlooking the ocean. Xiao Liu Qui is my favorite, because here you’ll find so many green sea turtles and fun coral gardens. If you are into wrecks then Penghu is your spot, but do have plenty of patience since permitting is required to visit them. In 2017 I had planned to to dive the quirky new hotel located in Taichung city called the DiveCube, then travel off to the beloved Kenting in the south. When preparing a trip to Taiwan, it is best to pre-plan as much as you can and have an alternate plan if the first doesn't pan out. On this trip I really wanted to dive, when I found that Taichung had the deepest pool in Asia I was sure that nothing could stop me from diving there. What is DiveCube, well it is a hotel with 30 guestrooms that that can accommodate 2, 4 and 6 people. What make this hotel so special is that it also contains a 21 meter deep pool for scuba divers and freedivers. The crystal clear water contains windows looking into the hotel, simulated shipwrecks and caves, and if that's not enough you can even do a underwater wedding here. The DiveCube opened in February of 2017 and is quickly becoming a destination for divers from all over the world. If you are coming to Taiwan and don’t have your gear no worries DiveCube has a very complete rental program as well. The pool itself is 21 meters deep roughly 6 stories, it is divided into 1.3 meters deep,3 meters deep, 7 meters, 11 meters deep and then 21 meters deep. This suites the varying diving skills and certification levels for divers. Tech divers can practice their skills in the caves and the shipwreck also the deep water. The hotel also acts as a training facility that includes demonstration rooms and large open classrooms. My dive at the DiveCube was terrific and an my guide very skilled. It went like this, I arrived and was escorted up to the surface level of the pool where the gear, bcds, regulators and cylinders awaited us. I quickly got my gear together and did a surface buddy check then we entered the water and at 1.3 meters did mask clearing and regulator removal and recovery. Then my guide checked my neutral buoyancy at 3 meters. When all checked out we dropped down to 7 meters and with an ok sign we proceeded down to 11 meters where my family awaited me at the big glass window in the restaurant. It was a thrill for me to see my then 3 year old daughter asking me if I was ok with her giving me the ok sign which I quickly responded to with an OK sign. We took photos, and it is here that I would like to caution that you will need a bright light, I have a Sealife DC 1200 with an internal flash which proved inadequate and left me wishing I brought my external flash along. Next time I will know better. After saying goodbye to my family my guide and I entered the deep hole and dropped down to the 21 meter bottom. The sides of the pool are darkened to give you the feel of diving deep and it is really cool to look up and see the lighter 11 meter level. We slowly ascended back to the 11 meters and then to 7 meters to go through the caves and the shipwreck. I really enjoyed the air pocket rest stop in the shipwreck. After exiting the shipwreck we head to our safety stop depth and and spent time looking around below at the other divers. Then we ascended to the surface where I exited the water and disassembled my gear. My experience at the DiveCube was the first of its kind in a deep water pool. The environment was safe and clean and the guided dive was expertly done. I have many good things to say about diving the Divecube and recommend it to my friends traveling in Asia. My next stop was on to Kenting in Southern Taiwan. A whole new adventure awaited me there. Kenting is a beautiful area giving the traveler a homey town and country feel. The area that I went scuba diving was near Houhubi Harbor where the dive shop that I discovered through pre-trip research was located. Kenting has a large number of professional dive operations and the traveler is well advised to do some research before getting there. For me, I chose a shop called Divepro and I was very happy that I did, the staff was friendly and very knowledgeable. Another note to the traveler is that Nitrox is used extensively in Asia. So, before traveling I suggest getting Nitrox certified, it will build your skill as a diver and allow more bottom time to enjoy the beauty that you will encounter in the fringing coral reefs of Taiwan. Also another difference is that in Taiwan when you dive you will most often hire the services of a guide. Just like getting your tanks filled in the States, in Taiwan you will get your tanks filled and meet your guide. I found this a terrific way to make new friends in my diving life. Local guides are a wealth of local knowledge and want you to have a good time. A bit of caution on this, Southern Taiwan can experience some unusually strong currents and local knowledge is invaluable. My dive day with Divepro started with arriving at the shop and meeting my guide, Rudy. I realized what a small world we live in when he told me he went to Cal State Fullerton, not far from my home in California. We filled out the appropriate paperwork and checked dive credentials, then we put our dive gear into a little blue utility truck and drove down to a fantastic little spot spot called Secret Garden. This fringing reef was abundant with reef fish, nudibranchs, Halibut and Unicornfish. The water temp was in April was 26 celsius and a 3 mil full suit was very comfortable. I recommend a full suit because a traveling diver may encounter jelly fish here or there. This spot did not disappoint, it was a fantastic first dive of the day. Exiting the water I found my then 3 year old daughter had brushed and urchin while looking at seashells on the rocky beach. We headed back up to the shop to get full tanks and take our surface interval while the staff attended to my daughter with tweezers, warm water, vinegar and cookies. She quickly recovered and by the end of my second dive she was again bouncing around again. The second dive site we went to was the warm water outlet for the nearby nuclear power plant the overlooks Kentings skyline. The spot called “Outlet” was amazing, entering the water you quickly enter a huge coral entrusted crevice which lets you out on a rock strewn bottom. The navigation is easy to follow since the rocks lay parallel to the coastline. The bottom is sand on one side and coral encrusted rock on the other. We found many small reef fish and nudibranch along with the beautiful coral that grew on the bottoms hard substrate. Rudy told me to keep my camera ready for the barracuda often seen here, I didn’t see them this day, but did get a pictures of a beautiful lion fish which I never see out here in the cold waters of California. The day we dove the Outlet the water was two degrees warmer here the the first spot we dove. It is here that scientist are studying a type of coral that is seeming to adapt to the higher temperatures around the warm water discharge of the power plant. Not all corals are able to make this adaptation so this is of great interest to the scientific community. Outside of diving, Kenting has a lot to explore and I recommend the National Museum of Marine Biology. The National Museum of Marine Biology has fantastic exhibits featuring the Waters of Taiwan, Coral Kingdom and Waters of the World. Besides being a museum it is also scientific research center, dedicated to marine biology and ecology and is leading the study of the warm water adaptation of certain corals. Kenting has a variety of places for the traveller to stay, but if you really want to get a good feel for the culture, check out the Youth Activity Center which is a hostel type hotel. It is located next to Frog rock and is a reproduction of traditional Fujian architecture. It is a short walk to the Main Street of Kenting for a night out on the town if that interests you. I recommend spending one night of cruising the main street for wonderful taiwanese street foods and picking up locally made trinkets. Kenting traditional “Youth Activity Center” a beautiful to experience traditional Chinese culture in Taiwan. A dive trip to Taiwan is a wonderful way to spend a vacation and I hope this article peaked your interests. The thing to remember, the more divers that visit a spot, the greater appreciation for that spot is made. Taiwan is truly deserving to be a world class diving destination with easy access to spots like Kenting, Green Island, Xiao Liu Qiu and Orchid Island. Taiwan won't disappoint the traveling diver and like me in my case, the travelin diver’s family too. I got up this morning at 4:00 am to go down to San Pedro and get on the boat we were taking out diving on this day, this would be my first dive trip of the year and I was very excited. We were to do two dives around “Blue Caverns” then head over to the USC Catalina Hyperbaric Chamber. The boat we would be on was the “Bottom Scratcher” and we would be diving a “live boat” since we would not be dropping an anchor in this “no anchoring area”. Blue Cavern is in close proximity to Big Fisherman Cove which is where the Catalina Hyperbaric Chamber is on the west end of Catalina Island. Why sign up for a two dive trip? I have always been one of those divers who believed that time underwater was like racking up points under my dive belt, but now that I am maturing in my diving I have found that some of our greatest learning experiences are out of the water, hence this month’s CPR class and this Chamber trip. Being a better diver isn’t how many dives you do, but really understanding dive theory and physics, understanding navigation and how to handle diving related emergencies, that all is learnt in the classroom environment then applied to the trips. Why are chambers so important anyway? I will explain this more in the diving sense rather than the medical sense since you are all divers. The purpose of the hyperbaric chamber, which is also called the diving decompression chamber, or recompression chamber is to treat diving related injuries and of course certain medical conditions. The Catalina Chamber treats air embolisms, decompression sickness and carbon monoxide poisoning. The first two of which are obvious to divers but the third, maybe not so. Think of carbon monoxide poisoning as this, a boater maybe working on his engine out at the islands in the confined space of his boat and may inhale carbon monoxide, he then passes out because the carbon monoxide has bonded to his red blood cells which travel to his brain and heart. This poisoning can be very serious and he would need medical attention immediately. Carbon monoxide can also be the result of a bad air fill in a scuba cylinder, this has happened once to me on a shallow dive and the experience was not one I wish to happen again. The pressurized oxygen in the chamber can break the bond of the CO molecule from the red blood cell thus respired out of the body. The chamber environment is perfect for such therapy. The diving conditions off California can be tough, cold water, strong currents wind and waves all can precipitate decompression sickness, especially on those days when the water is cold and the sun is out. These such days we are often suited up in 7 mil suits, in between dives in cold water and before you know it you become dehydrated. I am amazed that the chamber averages just one patient per month, it shows that the industry is doing well educating divers how to avoid the mysterious onset of DCS. There is still much more to learn and scientist are willing to admit this. The Catalina chamber covers an area from Dana Point to Ventura and out. Most patients come to the chamber through dive boats, the US Coast Guard and the Baywatch. The Catalina chamber has treated a wide range of people, from divers to movie set actors, from boaters to people inhaling carbon monoxide for whatever reason. In all since the opening of the chamber in 1974 they have treated over 1,100 cases. Let’s run through a simple scenario of what it looks like to treat a diver suffering decompression sickness, better known as the bends. Why do they call it the bends? Well the pain of having nitrogen bubbles in the joints caused divers to bend over in pain not only that, but bubbles could lodge near the spinal cord nerves and cause paralysis. The goal for the chamber is two-fold to decrease the size of the bubbles so small so that they can be exhaled out the lungs and to get oxygen to diffuse the nitrogen in the blood stream while nourishing damaged tissues of the organs. So, ok we got it so far, now what does it look like? The diver is brought in via dive boat or helicopter while breathing pure oxygen. He or she is then brought into the chamber and taken down or pressurized to a depth of 165 feet on regular air, 78 percent nitrogen and 21 percent oxygen. Then the chamber attendants will slowly bring the diver to a depth of 60 feet, which is known as the treatment depth. At 60 feet the attendant who is with the diver inside the chamber will put a bibs mask on the diver which will supply pure oxygen. The diver will breathe pure oxygen at 60 feet for 20 minutes. After which he or she will go back to breathing air for 5 minutes. Depending on the severity of the “hit” the diver may continue this schedule alternating 20 minutes of oxygen and 5 minutes of air. When the diver’s condition improves he or she will be brought up to 30 feet while still alternating oxygen and air. As their condition further improves the diver will be brought slowly back to the surface. Treatments such as this can range from 4 and half hours to twelve hours and over a number of days until recovery. This is just a simplified example as it was explained to us, as there are different schedules depending on the kind of hit the diver takes, but, it is a good general idea of how it works. This kind of treatment can save a diver’s life and is crucial for us as divers to understand. It can happen to any of us, at any time. Decompression Illness is still not fully understood in fact to cite Richard E. Moon MD, FACP, FCCP, FRCPC, Des F. Gorman MBChB, MD, PhD, in Physiology and Medicine of Hyperbaric Oxygen Therapy, 2008: “About 900 cases of DCS are reported yearly in the United States among recreational scuba divers. 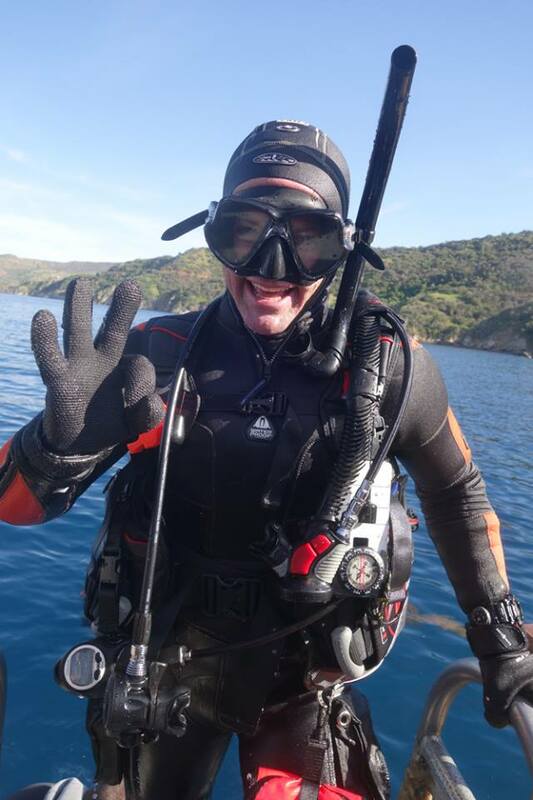 Most accidents occur in inexperienced divers. The incidence of DCS for recreational divers is 1 per 5000 to 10,000 dives, and for commercial divers, one incident per 500 to 1000 dives. Up to 50% of cases of DCS occur in divers who claimed to have been diving within the limits set by a standard table or decompression computer.” Even though the chances of taking a hit are small we still need the assurance of a chamber being there for us. The Catalina chamber is staffed 365 days a year twenty four hours a day, mostly by volunteers and a few permanent residents. They are truly dedicated individuals that could potentially make up the team that save our lives or the lives of loved ones. We need to support their continued operation, and attending Chamber days is a good way to do just that. Guide to San Miguel by Dan S.
San Miguel Island by Dan S.
The Northern Channel Islands are San Miguel, Santa Rosa, Santa Cruz and Anacapa. 20 million years ago the islands were off present day San Diego. The expanding Pacific plate has continued to push the Channel Islands northward. San Miguel Island lies off Point Conception and is a part of the faunal divide, separating Northern and Southern California ecology. Here, we are lucky to see the wildlife of both the northern colder waters and the warmer southern water. It is exactly for this reason conditions can be rough as the two regions converge. Here there are rockfish, wolf eels, lots of pinnipeds and even great whites. A real treat for us Southern California divers is to see the Sunflower Sea Star, which is the biggest starfish in the world and a cold water dweller. During one El Nino years we even saw scallop nosed hammerheads come all the way up from Mexico. San Miguel sits the farthest west of the all the Channel Islands and is remote even for most divers, in fact Richardson Rock is the last bit of land until one reaches Hawaii. San Miguel is 14 square miles and is buffeted by strong winds and erosion. It is a wild windswept plateau surrounded by pinnacles. At one time the pleistocene pygmy mammoth made its home here and scientist still find their bones as erosion exposes their fossilized remains. Today the most famous inhabitants of the island are the Island foxes and if you are into birds San Miguel is also home to many sea birds. Not only is the island remote but conditions can be harsh. The island sits exposed to the great pacific winds and waves. Divers face strong currents and cold upwelling, which bring nutrient rich water towards the surface. The water averages 10 degrees colder up here than the other islands, but all this cold water makes life abundant and diverse here. It is a very special place and if you made it out here then you already have been very fortunate. The average visitors to the island are less than 100 per year. As diving goes, because of its remote location and conditions many consider this an advanced diver spot. Consider the nearest hyperbaric chamber to be 100 miles at USC and the West End of Catalina at 108 miles. The first time I dove the spot my impression was that of diving in the “Wild West”. The best time to dive San Miguel is in the fall, October and November is fantastic diving here. San Miguel’s dive spot are numerous, some of the big ones are Lover’s Cove, Castle Rock, Judith Rock,Wilson Rock and Wycott Ledge. These “rocks” are actually the tops of undersea mountain ridges. Judith Rock is a good spot for a deep dive, lots fish and nudibranchs, it is best to go down the anchor chain and circle the rock right to left around the top of the pinnacle, This spot is a no take area as it is labeled an MPA. Point Bennett is one of my favorites, it is a challenging dive with lots of structure and equally challenging surge. Best to stay conservative and near the boat, if you venture out farther be absolutely sure to have a SMB and some way to alert the boat, also it is best to stay in the less than 60 ft depth range around Point Bennett. If the boat gets closer to the beach you may have a chance to dive the “Oil Spring” this spot has lots of craggy structure and sand, it is close to a major seal haul out so watch out for pinnipeds” Web- Footed Mammals”. Prince Island is a shallow reef and another favorite of mine.The current really rips here in a northern direction here, so start your dive heading south, This is also a big time lobster spot and great for macro photography. This is the spot the I once saw two scallop nose hammerheads from the deck of our dive boat Truth during the El Nino year of 2015. Lastly, off of Castle Rock is a spot known as Shark Park, in very calm weather it can be dived, but when there is a big swell running it is also said to be the heaviest wave for big wave surfers in California. Diving the North side of Castle Rock is also very exciting, and here you will find a series of ridges that are abundant with life, the current can be running strong near the top of the ridges but you can easily find protection diving the base of the ridges and exploring their craggy structure. Off of Point Bennett is also the wreck of the “Cuba”, launched in 1897 at Hamburg Germany she became a war prize when the US entered the first world war. She eventually was employed by the Pacific Mail Ship Company making runs from San Francisco to South America and Havana. On September 8th, 1923 at 0300 am off San Miguel Island the captain made a fateful navigational error in the fog that led to the ship’s demise on the rocks off Point Bennett. The captain and some of the crew remained aboard to protect the cargo and silver bullion on board while the passengers got off in lifeboats. On the same fateful day the fog took seven Navy destroyers off Point Honda.This was to become the Navy biggest peacetime loss of ships right off the California coast. During World War II the Navy took San Miguel for practicing bombing runs and naval bombardment. From then until the 1970’s the navy shelled the island, then beginning in 2014 the Navy spent two years clearing the island and in 2016 the Navy turned the island’s management over to the National Park Service while still retaining ownership to this day. I have been very very fortunate to have dove the island and will always consider it a blessing. No matter what the conditions are like there is something in store for the divers with a thirst for adventure. On days when the water was a green as a golf course I have seen amazing blue whales feeding on plankton, on days when visibility was 80 feet I have hung on the anchor chains to sit and marvel at the passing salps and their beautiful display of luminescence. Just come ready for adventure and a sense of wonderment at what the islands have to offer. Lingcod, Rock Fish, Lobster, Anemones, Scallops, Metridium Anemones, Nudibranchs, Green Abalone, Red Snapper, Sheephead, Horn Sharks, Octopus. HINT; this works for me I pick a fish to find then never find that fish but see so much more looking for my specific fish. Also from about June until October you can see Blue Whales in the Channel, during these months krill is most abundant. Hump Back whales can been seen from May to September, although I Have seen them in mid October as well. These whales are easily spotted by their acrobatic behavior and their relatively slow swimming speed. Plankton Blooms usually occur in the Springtime, during this time is when we see Gray Whales on their ceaseless 10,000 mile migration. This is the longest migration for any animal. They generally leave Alaska in October and pass through the Channel in December and January then again in February and March. Plankton blooms are what spawns all of this as zooplankton eats the phytoplankton and in turn zooplankton are eaten by fish thus the complex food chains begins in the Channel Islands. Guide to Santa Barbara Island by Dan S.
Santa Barbara Island (MPA) officially one of five channel islands, approximately 1 square mile with its tallest peak at 634 feet, that lies 38 to 40 miles from the California coast. What bring divers to Santa Barbara Island are the pinnipeds. They just love to check out divers and wonder at our bubbles. Have no fear they will not hurt you, just observe them and keep your hands to yourself. The island is now home to sea lions, elephants seals and seabirds (14 different seabirds nest on the island; these include brown pelicans, cormorants, pigeon guillemots (black with white strip and orange feet) and western gulls which will be nest on the island during our trips in June. Officially the island is not a volcano but it is composed of Miocene volcanic rock which is the result of uplifting of tectonic plates, the canyons have been cut by the ocean and wave erosion. The early American Indians used the island as a stop-over on fishing expeditions since it was abundant with sea life. It is not easy to dive the island, because of its small size and openness to large pacific swells. Also fog can creep into the island making surface visibility like pea soup, in fact if you had to survive on the island you can set up fog-catchers on the windward side of the island to supply fresh drinking water as the ancient people here did up to 4,000 years ago. When you find yourself at the island consider it a blessing as all conditions have come together just right. The North part of the island offers some of the best diving found in the Channel Islands. Dive spots here are Arch Point, Landing Cove and Shag Rock. Going to the south the boats pass the Sea lion Rookery and Cat Canyon, if you are on the West side the boat passes Hidden Reef or Arch Reef rounding Webster Point. The very south side has Sutil Island which is really a rock rising 300 feet out of the water. Hidden Reef: ¾ mile off Webster point. Sandy bottom with rock walls you will see purple hydrocoral, Coryactis anemones(strawberry anemone), lazy bryozoans(small calcium carbonates), nudibranch, lobster, bat rays scorpion fish and lingcod. Sutil Island: Thick kelp rocky bottom at 50, here you will see lots of kelp bass or calico bass, larger pelagic fish like barracuda, giant black sea bass, electric rays, octopus and tuna. Also keep an eye out for abalone here too. North west of here is a ledge to the rock bottom that drops off to deep water, the wall and a huge cave at around 70 feet called the Black Cavern. (Advanced divers or accompanied by a guide). It is an amazing sight. Cat Canyon: This dive site is just north east of Sutil Island. It is a terrific spot with lots of kelp and rock. There is a wall at around 50 feet that runs in a north south direction, following the wall to the south you will come across a narrow swim through at around 54 feet deep. This sight boasts playful sea lions as it is just south of the Sea Lion Rookery, bat rays, angel sharks, lots of fish as it is still a part of the MPA. This spot is a great spots for classes as it is sand and rock. Elephant Seal Cove: shallow bottom lots of sand watch for halibut, you will definitely see seals and sea lions here. This is a good place to watch them play. Also keep a lookout for angel sharks. A quick word about elephant seals, these guys can weigh in over a five thousand pounds(Males) 2000 pounds (females) and can be territorial. One of the largest recorded is actually here on Santa Barbara Island by Charles Melville Scammon who caught an 18 foot bull that yielded 210 gallons of oil in 1874. They are wild animals that deserve lots of respect and space. They are not too happy about uninvited guests. Sea Lion Rookery: Sand bottom on the Southeast corner of the island, dive bombing sea lions and curious pups. Bat rays found in deeper waters along with sea hares. Shag Rock in 150 feet out of the water, lot of kelp. Angel sharks and bat rays!!! General diving conditions: Water temps ranging from 50-65 degrees, Visibility generally very good 40-100 feet. Could have lots of surge and lots of current, dive with SMB and flash lights and keep aware of where the boat is and keep aware of your depth due to down current , up current and surge. Please Note: This is a printout of the Ocean Safari Scuba | Community | Dan Stephens page from 04/22/2019. Some information may have been updated in the mean time. Please visit PAGE URL to view the latest up-to-date information or call us at 626-287-6283 if you have any questions.